Thu, Apr 18, 2019, 16:27:07 ---- The fact: 42.844.000 visitors done. 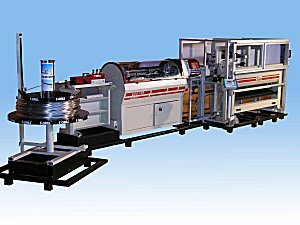 T-DRILL - The manufacturer & world wide supplier of tube processing and chipless tube cutting machines have made a number of improvements and additions to their range of Rotary Cutting Machines. The TCC-45-EF3 - Chipless Rotary Tube Cut-Off being equipped with integrated endformer has now an extended cut-lengths up to 6 meters (20). The fundamental idea is to cut and endform max 3 hits simultaneously in order to maximize rate of production. Now with the new long-length feature can also be used for longer cut-lengths than before. Steel tube chamfering is often required prior to endforming. T-DRILL is introducing a new Tube Processing Line to be connected in chain with chipless cutting. Typically the line is for chamfering, but other types of processings, like spinning or rolling, can also be connected to line. The line is suitable for diameters 5 22 mm and for tube lengths 150 3000 mm. The adjustments are electronically controlled providing easy settings and repeatability.